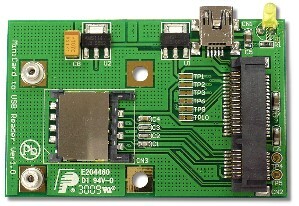 This development adapter converts any USB supported mini-Card module (i.e. WiFi, 3G Cellular) to a standard USB port which can be connected to PC system for test/debugging. There is also a an on-board SIM card slot for Cellular applications.